Paris (AFP) - After weeks of declining participation, France's "yellow vest" protest movement attempted to rebound on Saturday with a major rally in Paris which quickly turned violent. A large crowd gathered on the Champs-Elysees avenue for the 18th straight week of anti-government protests which initially rocked President Emmanuel Macron's administration, forcing him to adopt more anti-poverty measures, but had appeared to fizzle in recent weeks. Police fired tear gas to disperse protesters who erected barricades near the Champs-Elysees in scenes reminiscent of some of the most tense "yellow vest" rallies. Saturday's attempted reboot coincides with the end of two months of public debates called by Macron to take the heat out of the protests, which repeatedly ended in rioting in December and January. 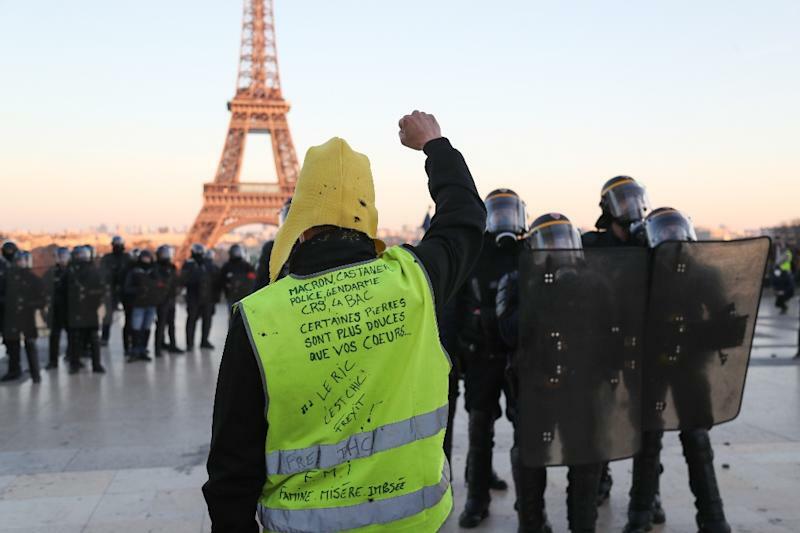 The level of participation will be seen as a bellwether of support for the movement, which began in November over fuel tax hikes but quickly ballooned into an anti-Macron revolt. Last week, only around 28,000 people demonstrated nationwide, according to the authorities, a tenth of the numbers that turned out for the inaugural protest on November 17. The organisers of Saturday's protest presented it as an "ultimatum" to Macron, prompting fears of a return to the violence that characterised earlier rallies. Over 5,000 police were deployed. A large security cordon had been thrown up around the Champs-Elysees, where the Arc de Triomphe war memorial was sacked and stores looted and vandalised by protesters on December 1 in images that caused shock worldwide. In December, Macron attempted to stopper the movement by pledging 10 billion euros ($11.2 billion) in tax cuts and benefits for the low paid and pensioners. He also launched a "grand national debate" on the internet and town hall meetings to gather opinions on how the country could be reformed. Laurent Casanova, an engineer who was among the protesters, told AFP he had come to mark the end of the consultations. "We have been patient but now we want results," he said. The protest is one of several planned in Paris on Saturday, where French climate campaigners are also planning a "March of The Century".